Transport Minister Andrew Adonis may have had civil servants plan his five-day jaunt around the country using a Railrover to coincide with meeting friends and chatting to those within the industry, but we at the LEYTR chose to travel around as much of the country by train as was possible in seven days, aiming to make the most of our first-class Railrovers by timetabling our trip to coincide with trains offering this accommodation (and the free food went down well, too). We planned our trip when the light nights were at their peak and had an excellent week - the latter becoming perhaps a little too humid for us both if we're honest. Read the full account below. It had been serialied in five parts on the main LEYTR blog. This now really is a 'blast from the past': RMs on Service 13. 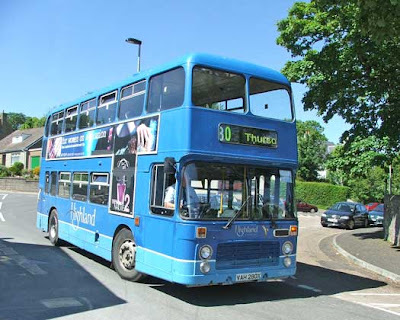 Many of Sovereign's RMs allocated to this route were referred to as Dartmasters on account of their Dennis Dart engines. 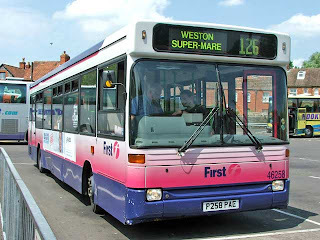 Service 13 was one of the last 5 routes to lose RMs in 2006. We stayed at the Ifor Evans Hall in Camden Town for the night - a basic room but for £25 a night in Zone 2, including an all-you-can-eat breakfast, it was a cracking deal. We regularly stay over in student accommodation when the universities are closed. Having dumped our things we caught the Northern Line to South Wimbledon where, en route to the Croydon Tramlink stop, I showed m'colleague where ITV's police drama The Bill is filmed. 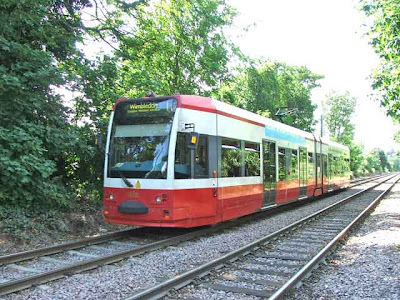 The Croydon Tramlink in its original red and white livery. The new colour scheme being applied to the trams now under direct TfL control is vastly different. We returned via Elmers End and the DLR before a few pints at the Head of Steam pub (now more aptly called the Doric Arch) adjacent to Euston station before heading back. 26 June was Day 1 proper and we made good use of our first-class Railrovers by availing ourselves of the first-class lounge at King's Cross station. 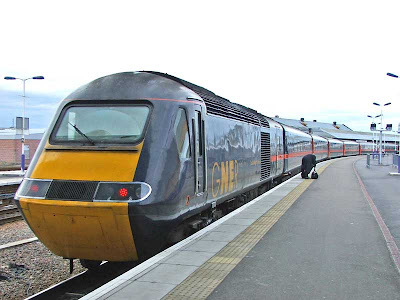 We travelled on GNER's Highland Chieftain (dep 1200) right the way through to Inverness, where we arrived in glorious weather bang on time at 2008hrs I seem to remember. "City of Kingston upon Hull" resting upon a punctual arrival at Inverness. I took a similar shot in February at this time, though in complete darkness. The train was the same but the livery wasn't! Having spent the night in a very good b+b, 27 June dawned with a trip to the Far North using a ScotRail Class 158 to the terminus at Wick. The early morning sunshine illuminates Inverness station's concourse as we board this ScotRail Class 158 to Wick. 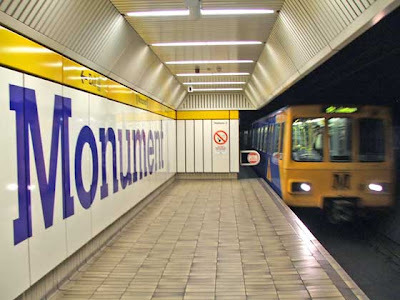 ScotRail's had two re-brands since this photo was taken! M'colleague jumped off at the most northerly rail junction on mainland Britain - Georgemass Junction - to take photos while I remained in the train, travelling to Thurso before reversing back to Georgemass and thence to Wick. 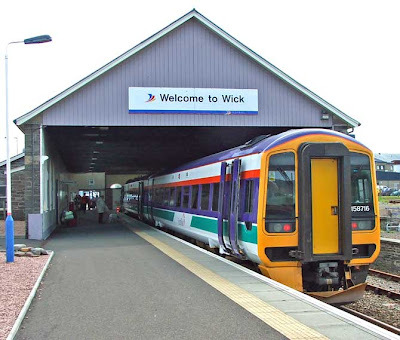 Journey's end: Wick station, the very end of the line. Both Wick and Thurso's stations look identical, even down to the mural of a steam train inside. The journey was not quite what I'd expected, largely because the scenery isn't as dramatic as that south of Inverness and that it takes around 4.5 hours to reach Wick. The then Scottish Citylink coach service was almost an hour faster, though we had first-class Railrovers so were sticking with the train. 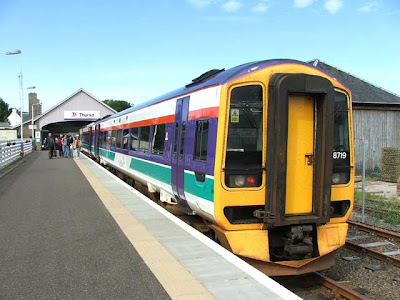 ScotRail's Class 158s generally have first-class compartments, though there is no first-class fare north or west of Inverness, so standard-class ticket holders could legitimately sit in first class. This isn't well publicised, obviously, and we had the entire compartment to ourselves in both directions. 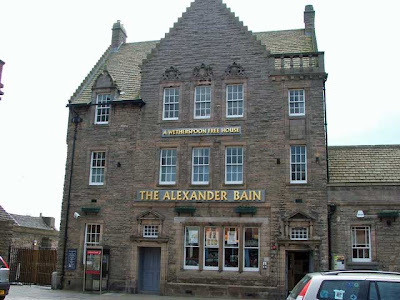 Wick boasts the UK's most northerly Wetherspoons pub - The Alexander Bain - which is where we found ourselves eating lunch. After an enjoyable lunch, we caught a Rapsons (remember them?!?!?!?!) 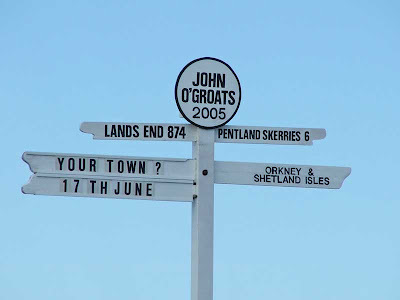 bus to the most northerly settlement in Great Britain, John o' Groats. I seem to remember the driver of Service 77A incorrectly issuing our rover ticket and we gained about a pound each. After a few photos at John o' Groats, we caught another Rapsons service to Thurso - this time it was a decker, a Bristol VR no less, and one that caught our eye as it was new to Eastern Counties. Services 77A and 80 run to precisely the same timetables today as they did four years ago. 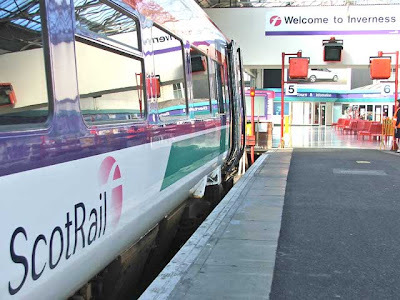 We left Thurso aboard a ScotRail Class 158, back on the rails and in first class. 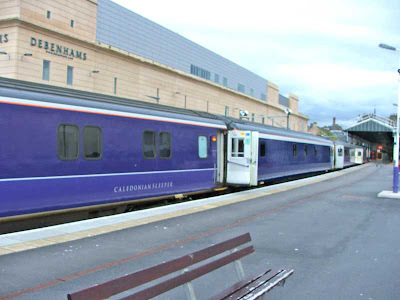 We arrived in Inverness about 20 minutes before our Caledonian Express sleeper service to London Euston. 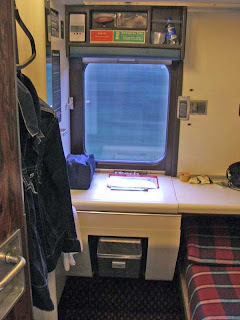 I'd never been on a sleeper train before and so took plenty of photos. We both sampled the incredibly expensive lounge car as we passed through the very dramatic scenery around Newtonmore, Kingussie, Aviemore etc. 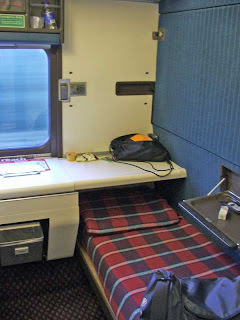 The first-class Railrover permits free travel aboard all sleeper services but does not afford a private birth. From memory we paid £27 each. We received complimentary papers and breakfast the following morning. 28 June dawned for me as we flew through Watford, en route to Euston. Upon arrival we caught a bus (Service 205) to Paddington where be jumped on a First Great Western HST to Cardiff. 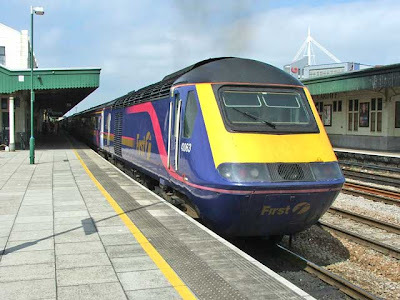 We forwent first-class travel to sample Class 37 traction up the Rhymney Valley and back before another First Great Western HST to Bristol Parkway and a Virgin XC Voyager to Temple Meads. We caught our one and only Pacer of the trip from here to Avonmouth where we overnighted before an early Sunday morning trip to Cheddar Gorge by bus. 29 June 2005 was our Day 4 and it started very early (for a Sunday) and the temperature was already very high in the centre of Avonmouth. The previous day's temperature hit 30C and was very awkward at times. 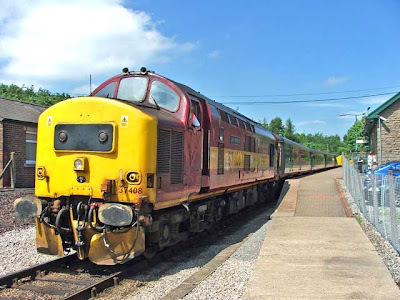 We both got sunburnt while stood at Rhymney station for an hour awaiting another Class 37-hauled train, only to find we were to be conveyed back to Cardiff by Class 156! 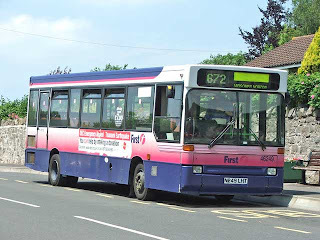 We caught a First bus into the centre of Bristol, where we awaited another First bus service, this time route 672, which took a very circuitous route to its terminus at Cheddar Gorge. The route took-in some very, very narrow roads and some impressive gradients, which made it even more impressive that a simple Dennis Dart was allocated to the run! With only an hour's connection at Cheddar Gorge, we did as much as could be done in the time and heat and an ice cream or two later we were back at the bus stop awaiting our next First bus service to Wells. From memory we caught Service 126 bound for Weston Super Mare, alighting at Wells where the temperature was still outrageously warm. We both took solace in the Tesco that was opposite the bus station purely for the much-welcome air conditioning. Our next bus (you'd not know we had first-class Railrovers in our pockets!) 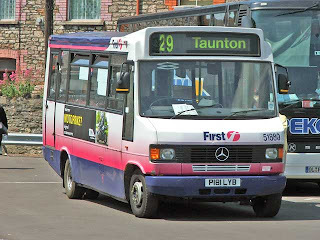 was again operated by First and was Service 29 to Taunton. We alighted at the rail station there and caught a Virgin CrossCountry train that theoretically left 90 minutes before we arrived; however, thanks to signalling problems earlier in its journey, we weren't waiting long at all. 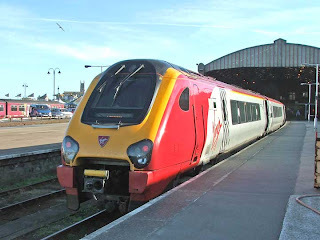 We caught the train to Exeter St David, where we swapped to another Virgin XC Voyager, continuing to its Penzance terminus. It was on board this train that we heard the most sycophantic announcement imaginable from the chap in the buffet car as he left the train mid-route. He thanked us all for our company and said how much he enjoyed the stories we'd shared with him and how he very much looked forward to meeting us all again. We had a few hours in Penzance, though with Sunday bus timetables, found it impossible to visit Land's End. 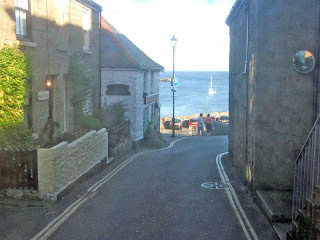 We instead chose to take a ride to Mousehole and back aboard a First minibus Service 6. What a route! Wow! Streets so narrow even a Beaver-bodied Mercedes-Benz minibus struggled to negotiate. A bonus was that we were able to legitimately use out First Day Tickets that we'd purchased a good few hundred miles away earlier in the day in Avonmouth! We were then to board the Cornish Riviera sleeper service to London Paddington. 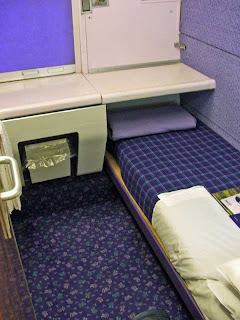 This is the only sleeper service in the UK not to be operated by ScotRail, though First as a company has cornered the market since it owns both ScotRail and Great Western (who operates the Cornish Riviera). 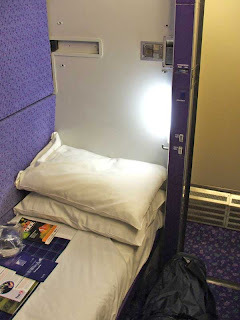 The births, from memory, cost a couple of pounds more than the ScotRail sleeper and the complimentary breakfast was less substantial! That said, it really is a great way to travel from the far south-west to central London. During the journey we were both asked to sign a petition against the withdrawal of the service, since First were then claiming the train was running at a loss and were after removing it. The staff who crew the trains (two operate at any one time) only staff the sleepers so were very conscious that their jobs were in the firing line should a full withdrawal be made. We both added our names to the petition and it was a year later I remember seeing that First had given the Cornish Riviera a reprieve. Part 4 starts on Platform 1 in Paddington Station, where our Cornish Riviera train had arrived 90 minutes before we were required to disembark. It's a strange and slightly uneasy feeling, asleep in a carriage on Platform 1 as the morning peak is starting to ensue. Today was 30 June 2005 and our Day 5. We had today and two more days to go, using our All-lines first-class Railrover ticket. Today was also the day both editors parted company. Going it alone: m'colleague disappears to Warwick while I travel by Class 450 to Portsmouth. I chose to stick to the schedule and made my way by Tube to Waterloo Station, where I caught a South West Trains (SWT) service to Portsmouth and then onto the Isle of Wight. M'colleague - having spent much of yesterday with me on buses - was in dire need of substantial yet complimentary food - so planned an impromptu trip up the West Coast Main Line (WCML) to the West Midlands and back c/o Virgin West Coast, where he sampled the opulent free food to which those travelling first class are entitled. 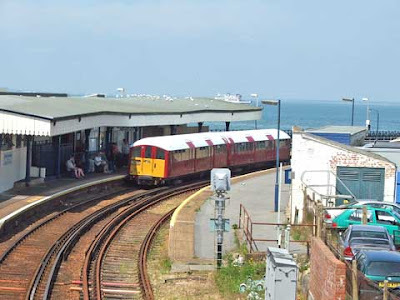 I'd never been to the Isle of Wight before and at Portsmouth Harbour paid my return trip on the Wightlink FastCat to Ryde - receiving a 34% discount thanks to my Railrover! 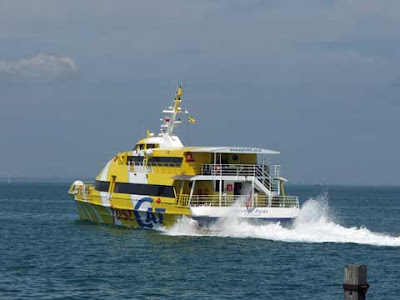 The Wightlink FastCat - fast but expensive! I had plenty of time to take photos of the unique Island Line train service operation on the island, using 1938 London Underground stock. 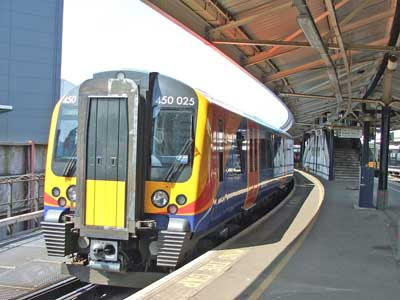 Many are very critical of SWT, choosing not to retire trains that are 72 years old, and to make the required investment in newer vehicles; personally, I think they fit in well on the island - they look just the ticket for the tourists, while also offering suitable journeys for the island's commuters in that area. 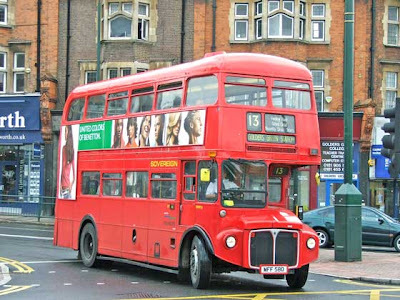 Although they are outdated Tube trains, they are operated in full accordance with the National Rail guidelines and offer everything you'd expect any other train service in Great Britain to do. This train was built in 1938 and spent much of its first life working Bakerloo Line Tube trains until retirmement came in the form of the Island Line. Having subsequently caught one of the trains from Ryde Esplanade to the terminus at Shanklin, I had an hour before catching my first-ever Southern Vectis bus to Yarmouth. 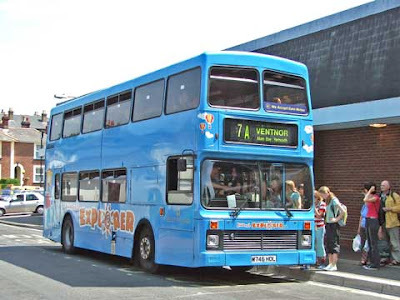 My bus was Service 7A destined for Ventnor and was a service we'd planned to catch as it skirted virtually all the south and south-west of the island before I alighted at the stop nearest Yarmouth's ferry terminal. Today was nice - the temperature was a few degrees shy of 30C and the cool breeze felt on the crossing from Yarmouth to Lymington was very welcome indeed. 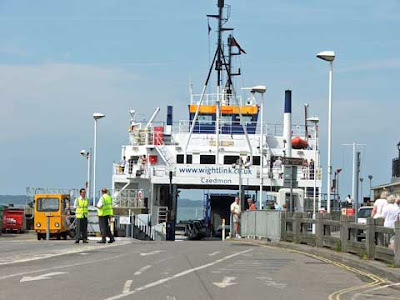 A return from anywhere on the mainland to anywhere on the Isle of Wight is possible on any service crossing the Solent. So Portsmouth-Ryde and Yarmouth-Lymington is possible. This was something we'd not been able to get confirmed prior to the trip I seem to remember, though I had it confirmed verbally on the day. Taken at Yarmouth, this Wightlink Ferry gets ready to sail to Lymington. 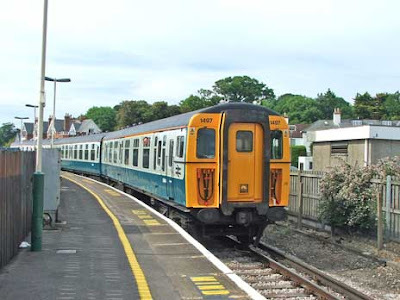 M'colleague had planned to meet me at Lymington Pier, where he arrived on one of the historic slam-door Class 421 electric trains used on the service. It was one month before we visited that SWT had chosen to keep the Class 421s on the Lymmington Branch due to its self-contained nature and had set about renewing them so that they were able to continue operating post-November of that year when all slam-door emus had to be removed from service. A few months ago we learned that SWT plan to remove the Class 421s altogether by the end of the year, which would bring to an end over half a century of slam-door operation on this route. The historic Class 421 electric multiple unit named Freshwater. 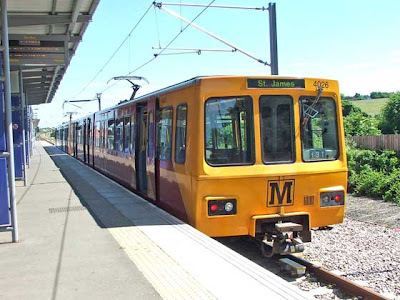 This and its sister train are now the only remaining slam-door trains operating on the National Rail network. 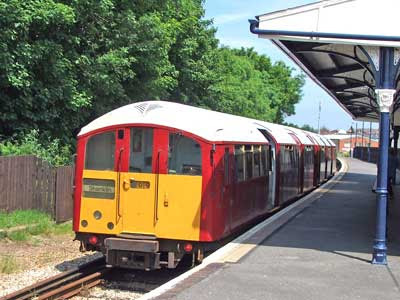 We caught 1497 Freshwater to Brockenhurst Station where the service terminates. 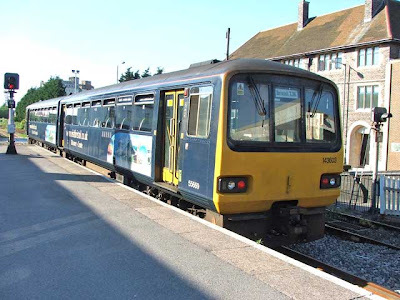 We then had a short hop aboard an SWT Class 450 to Pokesdown, where we stayed overnight at a b+b. Day 6 started with what Top Gear were to copy from us: we left Bournemouth aboard a Virgin Cross Country Voyager and parted company at Basingstoke to have a race to the first-class lounge at Euston Station. 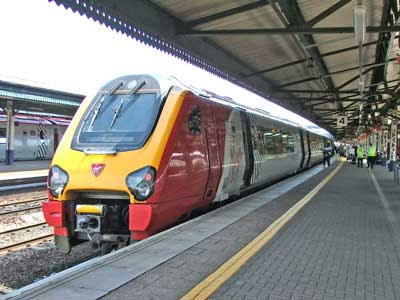 I formed the Clarkson opinion that remaining on the Voyager to Reading and then onto a Class 180 Adelante into Paddington then a Service 205 bus to Euston would be the quickest way. M'colleage (Hammond/May combined) said this was quite frankly ridiculous and the quickest was was to alight at Basingstoke onto a SWT service to Victoria and to catch the Underground to Euston. Thanks to problems entering Reading, I now had plenty of time to take photos thanks to a missed connection. I would have won had it not been for the 5 minute wait to be allocated a platform at Reading. Everything else went like clockwork. In typical Top Gear fashion, m'colleague had not managed to take a sip from his first buckshee gin & tonic when I burst through the door, a little flustered. 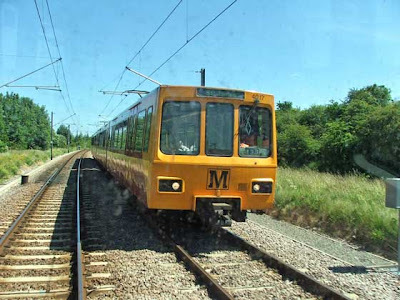 They are now regular performers in the LEYTR area, running for Hull Trains along the ECML. 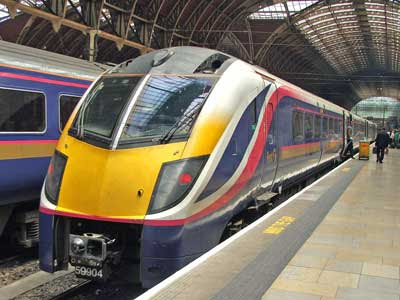 In 2005 I took my first trip on one - a Class 180 Adelante, between Reading-Paddington. We had an hour to kill here before catching a Virgin Pendolino Class 390 to Manchester Piccadilly and back. 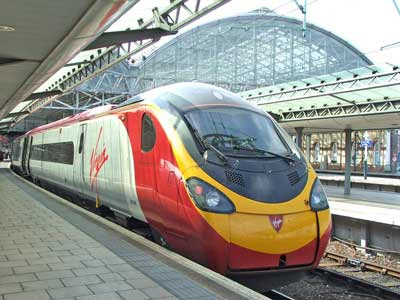 I'd never been on a Pendolino before and in 2005 they were relatively new. 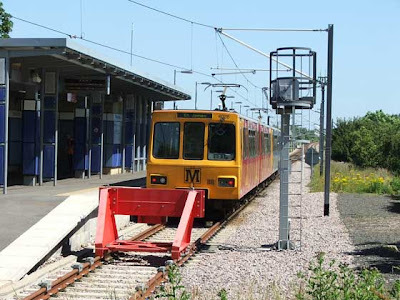 Very little remodelling of the WCML had taken place by then and yet the journey seemed very smooth and efficient. While in Manchester, we spent our hour looking down at the melee from the confines of the first-class lounge, equipped with its mini bar and fridge. Today was my first-ever trip on a Pendolino. Very impressive! Our return trip to Euston took place soon after 1700hrs and we were treated to wine and Belgian chocolates in addition to the three-course feast. It is outrageous that Virgin can offer everything edible for free and yet GNER that was offered only free juice/water, fruit/cookies. NXEC have actually got worse! Back in Euston and very impressed with the journey, the surreptitious tilting on bends, the food and the on-board hospitality, it was back to the first-class lounge to await our third sleeper service: this time Euston-Fort William. 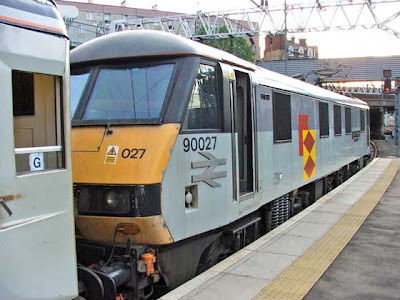 This was our traction from Euston to Edinburgh: an electric Class 90 loco. North of Edinburgh the lines are not electrified, so diesel power is required thereafter. Day 7: M'colleague and I had spent our third overnight journey aboard a First ScotRail sleeper train from Euston to Fort William. 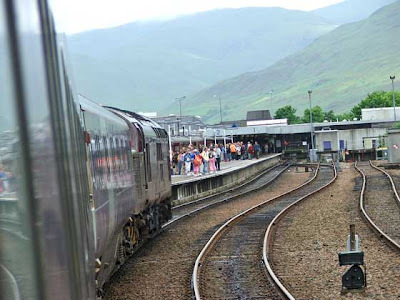 Initially hauled by an electric Class 90, the train's 13 carriages were split in the wee small hours at Edinburgh Waverley to form three onward services: to Aberdeen, Inverness and Fort William, hauled by either Class 37 or 67. 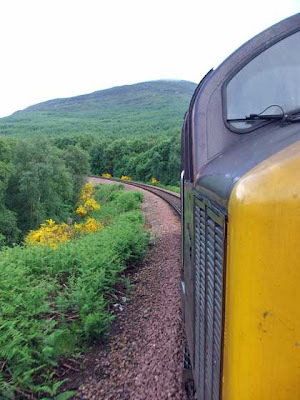 My slightly unusual perspective of the West Highland Line. 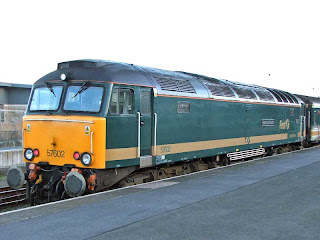 Class 37s are no longer used to haul the sleeper services in Scotland. My private birth was the first in the leading carriage as we departed Euston - a sublime position for photos out of the carriage window, of both the loco and the seemingly endless carriages behind - but not very comfortable for sleeping since the proximity to the coupling meant I was in for a very jerky ride. This was one of the reasons why I didn't feel like getting up too early as we progressed northbound along the West Highland Line in what can only be described as amazing scenery. I did get up and join m'colleage in "fotting" the scenery about half an hour before our arrival at Fort William. The complimentary breakfast was up to the same standard as that we'd enjoyed at the start of Day 3, though there were no complimentary news papers I seem to recall. Undertaking this type of week-long jaunt, where you aren't basing yourself to a specific location for anymore than 9 hours, means you do miss out on both local and national news stories. Admittedly, I just forked out 35p for a paper at the Tesco opposite Fort William station but the advertised complimentary copy would have been nicer touch though. We started with 13, now we're down to 3 - carriages that is. I'm stood at the very back of our Class 37-hauled Caledonian Sleeper train as we approach the terminus, Fort William, in the rain. This was my first visit to Fort William and it was raining. 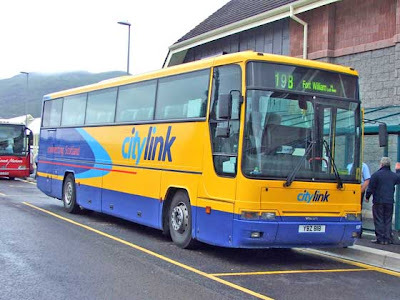 We didn't have long before we had to catch a Scottish Citylink coach service to Inverness in order to catch a ScotRail service to Aberdeen and then onto another for Edinburgh. In 2005 Citylink was a wholly-owned subsidiary of ComfortDelGro, with no input from Stagecoach and so - unlike my most recent experiences on their services - the advertised Citylink coach service was operated by just that: a Scottish Citylink-liveried vehicle with reclining seats and on board toilet. Quite a contrast to a bog-standard, toiletless, rigid-seated, Stagecoach-liveried Volvo B10M that conveyed us betwixt the two localities last February. 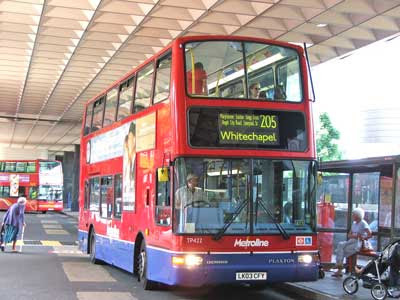 This was the scene in 2005; in 2009 this service (now numbered 919), despite continuing to be promoted as a Citylink service, is operated by a generic Stagecoach Volvo B10M that has fewer internal features than this ageing ex National Express Expressliner! The coach service got very busy I seem to remember with ad hoc patronage very high. 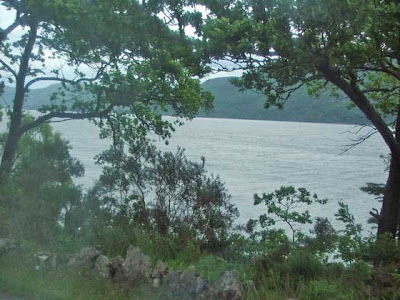 The views of Loch Ness were excellent and we'd positioned ourselves on the correct side of the coach so we could take this in. The rain had stopped by Inverness, which had been our most-used station throughout this Railrover jaunt, making three departures from here. No sign of Nessie: we did keep a watchful eye out though! Having travelled up to Inverness via the Highland Line, we chose to travel to Aberdeen via Elgin and the north-east coast. It was a nice enough journey though nothing like that via Kingussie and Blair Atholl! We had very little time in Aberdeen before out next service to Edinburgh departed. 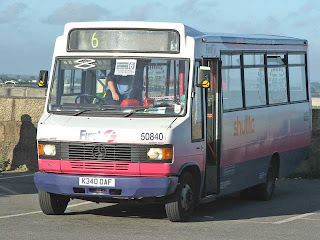 M'colleage, having learned that the first Volvo B7Rs purchased by Stagecoach were being deployed on Service 10 linking Inverness with Aberdeen, shot out of the station to try and catch one of these vehicles. He managed it and with a good minute to spare before our Class 170 left for Scotland's capital city. It was also at this point that I realised my memory card on my digital camera had been filled! We were delayed upon arrival into Edinburgh and it looked as though we'd miss out connecting GNER high-speed service to Newcastle and onward connection to Sunderland. We arrived at precisely the same time the GNER service was due to leave though were happy to be informed via the public address system that those wishing to catch the GNER service to London et al had a few minutes to get to platform 1 where it would be waiting. It wasn't waiting, it had gone. We were one of the first to leave the train and one of the first to get to platform 1 where we were greeted with just empty tracks. Of course I could now start a rant about how in good old BR days the train would have waited and we'd not have to wait 90 minutes for the next one. But, having travelled all over the country during the past week, all our connections had been met and we were still in possession of first-class Railrovers, so availed ourselves of the facilities located in the first-class lounge. We had the entire place to ourselves. After 7 days I'd become rather tired of chocolate chip cookies, complimentary tea and fruit, but nonetheless forced myself to consume even more. When we did eventually board what was the last southbound GNER departure from Edinburgh to Newcastle, we deliberately sat in coach A. The reasoning for this was so that m'colleage could smoke. Signs had been placed throughout the train telling passengers that from the end of July that year, GNER would operate a strict no-smoking policy on all its trains. Two years later, though not known to any of us at that time, it would be extended nationally to cover any structure with two or more sides! 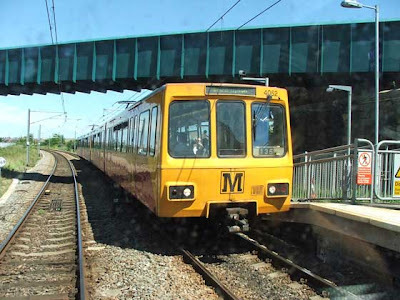 The last train we used our Railrovers on was a Pacer for travel from Newcastle to Sunderland. We waited an eternity for a taxi to take us from Sunderland station to the b+b we'd booked along the seafront in Roker. To summarise our Railrover experience, it is something that anyone interested in public transport should undertake. Obviously it helps if at least one of those travelling has more than just a vague understanding of Britain's railway network, but it is not a fundamental requirement. Throughout our travels we'd been to many places in England and Scotland and honed our itinerary to take-in special workings (Class 37-hauled services to Rhymney) as well as journeys that either one or both of us had yet to made (Thurso by train, a trip on a Pendolino), not to mention sleeper services where, for the price of a reasonable b+b, travellers can get from A to B very efficiently and ensure very little time is wasted, should you be on a tight schedule. The parallel between Lord Adonis' recent Railrover experience and ours is that we both did them to further our knowledge of the network. Be you a novice, a hard-core rail enthusiast or the Minister of State for Transport, it's something that cannot be anything other than beneficial. N.B. For those interested in how we returned to Lincolnshire from Roker, we spent 2 July travelling the Tyne & Wear Metro system and on 3 July I caught one of those new-fangled Megabus services from Newcastle to Meadowhall and then Transpennine Express train, while m'colleague caught a National Express Butlins special coach service direct from Sunderland to Skegness. 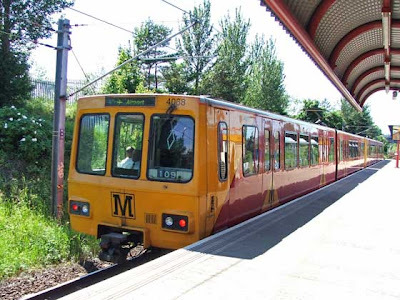 Some photos of the T&W Metro can be seen below. 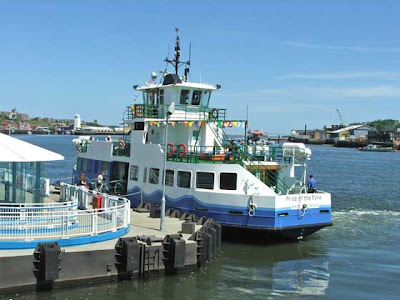 It may not look like a light rail train but the Shields Ferry plays an integral part of the Metro system, permitting travellers to travel between North and South Shields quicker than travelling around the river by Metro.